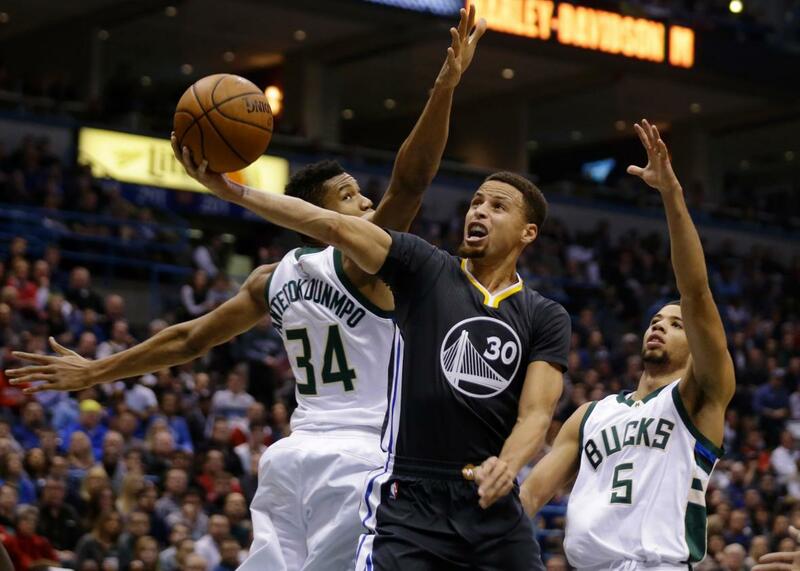 Steph Curry’s top-five plays of 2015–16 (VIDEO). The most preposterous plays of the year from the league’s most magical player. Stephen Curry, No. 30, drives to the hoop for two points during the first quarter against the Milwaukee Bucks on Dec.12, 2015 in Milwaukee. After a record-shattering start to the season, the Golden State Warriors finally lost their first game of 2015–16 on Saturday to drop to 24–1 on the year. For basketball fans, the Warriors have been appointment viewing this season, dominating opponents by more than 13 points per game with a mix of fundamentals and flair. The team is still a serious threat to set the NBA’s all-time regular season win-record. Of all there is to love about this team—Draymond Green’s evolution into a Swiss army knife, Klay Thompson’s ability to go supernova, Luke Walton winning the NBA Coach of the Month award without officially winning any games—there’s been no one more impressive than star point guard Steph Curry. Less than one-third of the way through this season the question is no longer whether Curry is the best shooter in the league, but just how much better he is than everyone else. There’s a statistical case to be made—as Benjamin Morris laid out in FiveThirtyEight—that the best team in basketball would be even better if Curry’s teammates started passing up easier shots so that he could take significantly more difficult ones. You don’t need to know the difference between a player’s true shooting percentage and their effective field goal percentage, though, to appreciate that Curry has been making at least one seemingly magical play—and often more—every game this season. In that spirit, here at Slate we are launching our inaugural “Steph Curry Spiciness Index.” We’ll be posting his best play after every Warriors game for the foreseeable future, as well as keeping a rolling list of his top five plays of the season. Without further ado, then, here’s Curry’s latest offering, along with our introductory top five. Playing their final game of a seven-game road trip less than 24-hours after needing double-overtime to beat the Boston Celtics for win 24, an exhausted Warriors team just didn’t have the legs to pull this one out. Curry, though, still had enough left in the tank to give us the play of the night, sending Giannis Antetokounmpo in the wrong direction with an effortless looking between-the-legs crossover, which he followed up with a left-handed, and-one layup. Note: This one didn’t crack the season’s top five, but that says more about Curry’s current cannon of highlights than it does about this particular play. Without further ado, here is the Spiciness Index. On a night when the home team was honoring Dell Curry, it was the former sharpshooter’s eldest son who stole the show. Curry exploded for 28 points in the third quarter, scoring his team’s final two-dozen points in the period and hitting 10 of 11 field goals and all five of his three-point attempts, including this buzzer-beating, long-range bomb. Like a few of the top five—and a countless number of his made buckets this season—this would have been a dumb shot for anyone but Curry. Curry can put the ball in the bucket from almost anywhere on the court, but he also has an uncanny ability to get his teammates easy looks at the hoop with what seems like impossible vision and anticipation. Against the Pacers, Curry flashed to the free-throw line to receive the pass and then, as two defenders converged on him, he took a single dribble with his left hand before flipping a right-handed lob over his head to an uncovered Andrew Bogut for the easy two. What the what? There were a couple contenders in this game. After losing control of the ball late in the first, Steph wrestled it away from Bulls’ big man Joakim Noah and chucked a perfect one-handed lob from well outside the three-point line to a streaking Andre Iguodala for the slam. This would be a season highlight for anyone else. But it wasn’t even his play of the game. In addition to his three-point acumen, Curry has turned himself into a close-range assassin as well. Here he takes the ball hard to the hoop after making Kirk Hinrich look silly with a between-the-legs-behind-the-back work of ballhandling art. Final score: Warriors 100, Grizzlies 84. Late in the third quarter, Steph stole an entry pass on the defensive end, raced across half court, and—falling forward after being bumped—launched a circus shot from 29-feet in an effort to draw the foul. He didn’t get the call. Instead, though, his one-handed prayer found the backboard on its way through the hoop. Sometimes it’s better to be lucky than good, but it’s always better to be both.